I post this picture against my better judgment. I can already hear my mother’s voice of concern for my family’s well being. But this photo is just too awesome not to share. 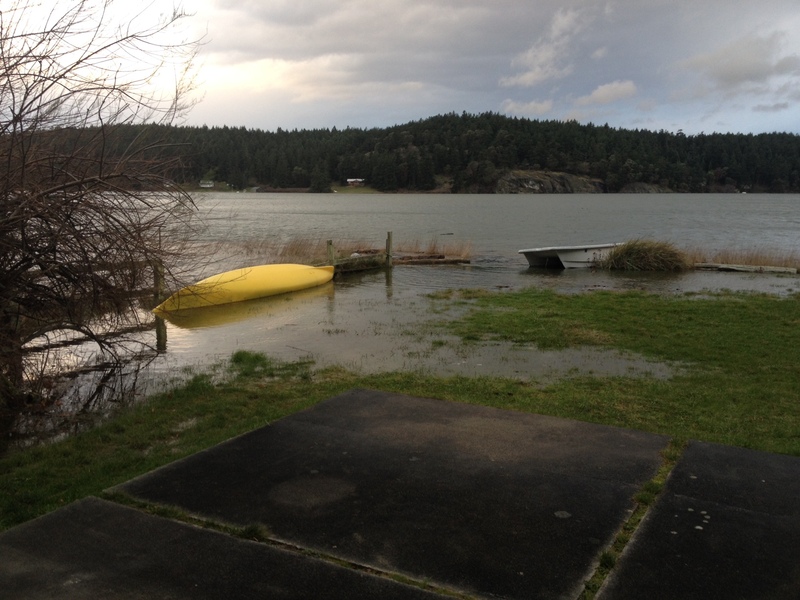 This week’s extreme weather in the Northwest is leading to record high tides. Combine that with very strong winds from the north, and you get a Fry Lodge yard that looks like this. Kristine took this photo at the high water mark. Though the water is indeed close to our door, it would have to get quite a bit higher before we’d be in trouble. That said, if you’re looking for the perfect Christmas gift for Fry Lodge, sandbags might be just the thing. For all you concerned grandmothers out there, five minutes after this was taken the water had already receded back to the edge of the yard. OH my! I have often wondered what year round living on Lopez would bring. Aren’t you happy this happened during the day when you are able to watch it? Stay safe. Happy Birthday yesterday, Ruby! Hope you had a wonderful day!